Since 1990, GLERL scientists have been measuring temperature in the middle of southern Lake Michigan (at approximately 42.68, -87.07). They’ve been using a vertical chain of instruments that measure temperature from top to bottom. This is one of the longest vertical temperature records in existence anywhere in the Great Lakes, and it reveals some interesting patterns about lake temperature and the seasons. We’ve created a static infographic as well as an interactive chart that allows you to zoom in on the data and get individual measurement values. Below, check out our infographic explaining seasonal temperature profiles in Lake Michigan. Click here to interactively explore Lake Michigan temperature data. 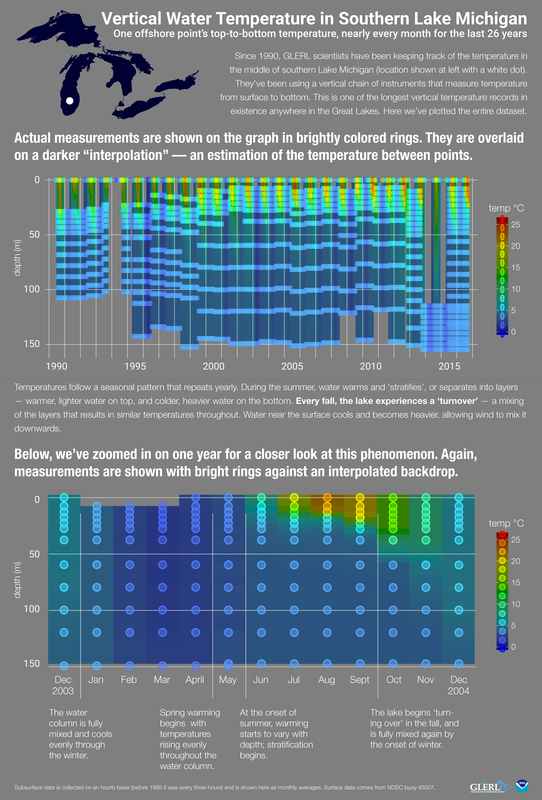 Lake Michigan temperature data infographic. NOAA’s Great Lakes Environmental Research Laboratory (GLERL) recently published a very detailed NOAA Technical Memorandum (GLERL-169), which identifies the potential for introduction (getting in), establishment (living and reproducing), and impact (changing the ecosystem in one way or another) of 67 species that were previously identified through peer-reviewed research as being highly likely to invade the Great Lakes basin. The study also identifies a subset of 16 species (5 plants, 6 fishes, 4 invertebrates), which should be considered the highest overall risk to the Great Lakes region (see photo gallery below). The tech memo—titled “A Risk Assessment of Potential Great Lakes Aquatic Invaders“— is the result of a large collaborative effort between partners all throughout the Great Lakes region. The paper was authored by Abigail Fusaro (Wayne State University), Rochelle Sturtevant (NOAA’s Great Lakes Sea Grant Network liaison with GLERL), Ed Rutherford (NOAA GLERL) and others—including 5 student co-authors and more than 30 students who contributed to the literature review, assessment of individual species, and editing of the final report. NOAA GLERL—in cooperation with United States Geological Survey (USGS)—has been tracking nonindigenous aquatic species (species that enter a body of water that is outside of the historical range, in other words, they’ve never lived there before) in the Great Lakes system and serving that information through the GLANSIS database since 2003. Information in the GLANSIS database includes an overview of the species life history, ecology, and invasion history as well as maps of current distribution, comprehensive impact assessments and overviews of management options—all very useful and important information for tracking invaders. An enhancement to the database in 2011* gave researchers the ability to add information on species that pose a risk of invasion, but are not yet established in the Great Lakes. The addition of these assessments, which were previously published in peer-reviewed scientific literature, helps to identify the species that pose the highest overall risk (introduction + establishment + impact). This information is key in that it allows scientists and environmental managers to better monitor for invasions and make decisions about management options in a rapid response situation. The risk assessment tools developed for GLANSIS apply a consistent approach across all taxonomic groups and vectors, and allow researchers to compare the potential impact of high-risk species with the realized impact of nonindigenous species that are already established. The tech memo serves as documentation of these tools and approaches as well as examines cross-taxa patterns in risk. An analysis of the risk assessment method itself and its results will appear in an upcoming issue of Management of Biological Invasions. For more information on GLANSIS, please contact Rochelle Sturtevant, rochelle.sturtevant@noaa.gov, 734-741-2287. *This was made possible with funding from the Great Lakes Restoration Initiative.